During the start we had the men leading the group. Our Sensei ran at the back to keep all the ladies together. One of the very first obstacles was to walk upstream waist high through the river. For this we had to link together as some of us are strong swimmer and others not….we pulled the whole team through. Slipping and sliding while running through the forest we made our way to the open field where the next obstacle awaited us. The mud monster was tough and we struggled for nearly an hour to make our way through and over the monster. 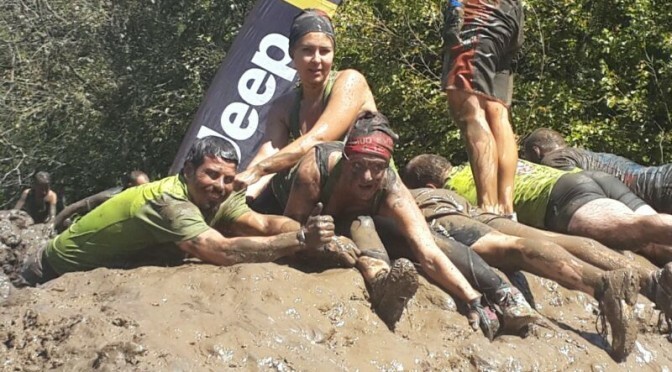 Again, without the help of our team AND other warriors we didn’t even know, we would not have been able to complete this obstacle. Along the way we fell, we were bruised, we were bumped and we scratched our legs, we moaned, we laughed, we held hands…..we came and we conquered! The last obstacle was the tower of rage which is a 4 / 6 m jump into a dark pool of water. We had to motivate our team members, who had a fear of heights, to take the jump and we are proud to announce that everybody overcame their (personal) fears that day and took the jump (metaphorically speaking). To all our Warriors…..BE BRAVE!!!! !